Researchers at University of California San Diego School of Medicine and their collaborators have developed a technique that allows them to speed up or slow down human heart cells growing in a dish on command—simply by shining a light on them and varying its intensity. The cells are grown on a material called graphene, which converts light into electricity, providing a more realistic environment than standard plastic or glass laboratory dishes. The method, described in the May 18 issue of Science Advances, could be used for a number of research and clinical applications, including: testing therapeutic drugs in more biologically relevant systems, developing use-specific drugs that are more precise and have fewer systemic effects, and creating better medical devices, such as light-controlled pacemakers. "When we first got this working in our lab, suddenly we had something like 20 people gathering around, shouting things like 'Impossible!' and accusing me of pranking them. We'd never seen anything like this before," said first author Alex Savchenko, Ph.D., a research scientist in the Department of Pediatrics at UC San Diego School of Medicine and Sanford Consortium for Regenerative Medicine. Savchenko led the study with Elena Molokanova, Ph.D., CEO of Nanotools Bioscience. While in some ways simply a thinner version of graphite ("pencil lead"), graphene's unique properties were only truly appreciated relatively recently, an effort recognized with the 2010 Nobel Prize in Physics, awarded to Andre Geim, Ph.D., and Kostantin Novoselov, Ph.D., both physicists at the University of Manchester in the United Kingdom. Graphene is a semi-metal made up of a latticework of carbon atoms, the same element that forms the basis of all living organisms. Part of what makes graphene special is its ability to efficiently convert light into electricity. In contrast, glass and plastic are insulators—they don't conduct electricity. Most biomedical research relies on individual cells or cell cultures grown in plastic petri dishes or on glass plates. "Yet in your body, you don't see many surfaces acting like plastic or glass," Savchenko said. "Instead, we're conductive. Our hearts are extremely good at conducting electricity. In the brain, it's electric conductivity that allows me to think and talk at the same time." Savchenko, Molokanova and other researchers have noted that cells in the lab grow better on graphene than other materials, and behave more like cells do in the body. Savchenko and Molokanova credit their backgrounds in physics for helping them look at biological systems a little differently than most. In this study, the researchers generated heart cells from donated skin cells, via an intermediary cell type called an induced pluripotent stem cell (iPSC). 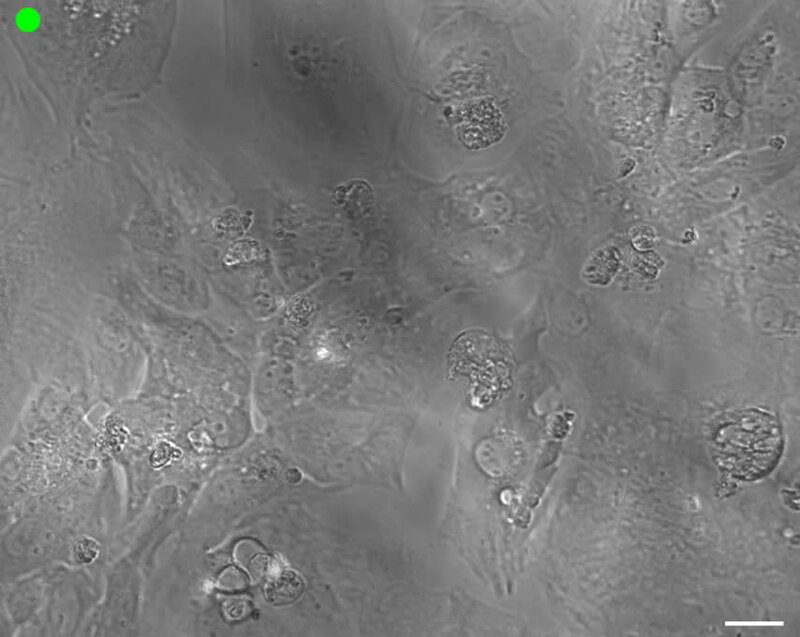 Then they grew these iPSC-derived heart cells on a graphene surface. Savchenko said it took the team awhile to pin down the optimal graphene-based formulation. Then they had to find the best light source and way to deliver that light to the graphene-cell system. But they eventually found a way to precisely control how much electricity the graphene generated by varying the intensity of the light to which they exposed it. "We were surprised at the degree of flexibility, that graphene allows you to pace cells literally at will," Savchenko said. "You want them to beat twice as fast? No problem—you just increase the light intensity. Three times faster? No problem—increase the light or graphene density." Savchenko and colleagues found they could likewise control heart activity in a living organism (zebrafish embryos) using light and dispersed graphene. The team was also surprised at the absence of toxicity, which often presents researchers with a huge challenge. "Normally, if you introduce a new material in biology, you'd expect to see a certain number of cells killed in the process," Savchenko said. "But we didn't see any of that. It makes us hopeful that we'll be able to avoid harmful problems later on, as we test various medical applications." The researchers are excited about the many possible applications for this new graphene/light system. One potential use is in drug screening. Currently, researchers use robotic technology to test hundreds of thousands of chemical compounds, screening them for their abilities to change a cell's behavior. Those compounds that have the desired effect are further studied for their potential as a new therapeutic drug. However, many beneficial compounds might be missed because their effects aren't readily apparent in the condition in which the test cells are grown—on plastic, outside of the disease context. For example, researchers can test drugs on heart cells grown in a standard plastic laboratory dish. But those cells are contracting at their own pace, not modeling the conditions that might exist right before a person has a heart attack. The drugs they test on those cells might not appear to do anything if they are use-dependent—meaning the drugs only have an effect under certain conditions. To test this application, the team added mexiletine, a medication used to treat irregular heartbeats (arrhythmias), to their heart cells. Mexiletine is known for being use-dependent—it only has an effect when there is an increase in heart rate, such as occurs during an arrhythmia. 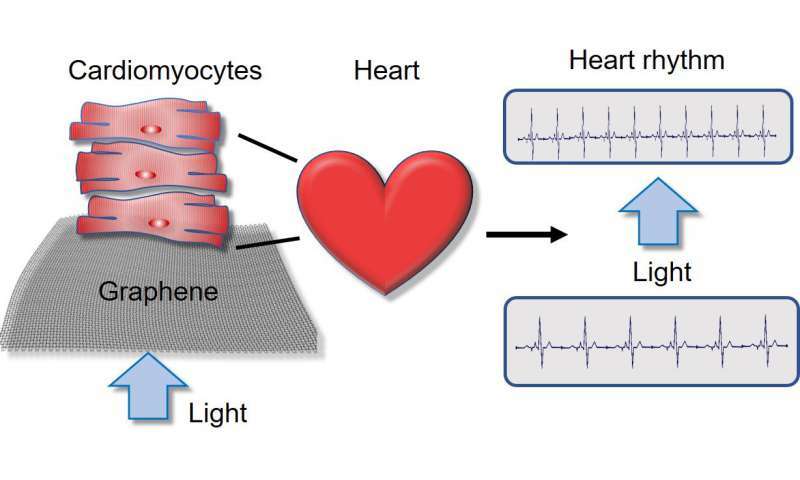 The researchers illuminated their heart cells on graphene with light of different intensities. The faster they got the heart cells to beat, the better mexiletine inhibited them. For now, the team is focused on heart cells and neurons. But they are interested in eventually applying their graphene/light system to search for drugs that specifically kill cancer cells, while leaving healthy cells alone. The researchers also envision using graphene to find opioid alternatives—use-dependent pain medications that only work when and where a person is in pain, thus reducing systemic effects than can lead to misuse and addiction. Finally, Savchenko believes light-controlled pacemakers made of graphene could be safer and more effective than current models. There's a lot of work to do, but Savchenko is optimistic. "You can squeeze a half-year of animal experiments into a day of experiments with this graphene-based system," he said.